The revival of James Baldwin's The Amen Corner is a reminder of how few plays approaching life from an Afro-Carribean perspective are ever re-staged or admitted to the canon of classic theatre. The play is set in Harlem, 1955; now a period which is fading into the shadows of history. We are transported to a community which is struggling to define itself within the no-man's land between two extremes. One is represented by the almost crushingly claustrophobic church community with its puritanical adherence to the social code of 50's America. The other is the jazz world, where the music implicitly carries a message of personal spiritual liberation, of 'attitude' and rejection of all the conformity and repression of the status quo. For the Afro- American of the time, these two different worlds were intertwined; but also represented the conflicting ways for the black community to deal with society. 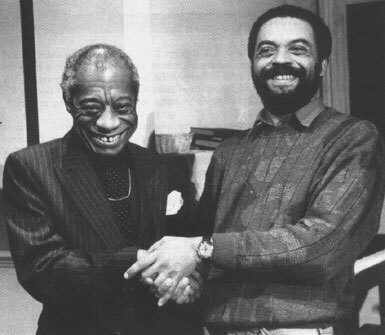 James Baldwin, who often spoke of his struggles with his father who was a preacher, in fact preached in his teens, before breaking away from that tradition and gravitating towards the bohemian world of smokey jazz clubs and the Left Bank of Paris, where he developed into one of America's greatest writers. The play, like most of Baldwin's writing, reflects his personal struggles and the society he grew up within; and as a piece of drama is informative in both the social and deeply personal way that is the aim of good theatre; as well as being highly entertaining. Although not being a great fan of gospel music, I was taken aback from the first notes sung by the members of the London Community Gospel Choir who make up some of the members of the cast. The music is sweet, powerful and uplifting and has the power to make even the most secular of us feel in touch with something beyond the immediate, the here and now. We are given an insight, both through the play and the music itself, how close are the two worlds, the sacred and profane; and the role of music in both defining ones collective social position, and transcending it. Behind the choir is the pianist who accompanies the singing with the understated jazz fills of a musician finding his way through the orthodoxy of structure which jazz began to take apart and rebuild in a multitude of different ways. For Baldwin himself, a man who made little secret of his homosexuality in a time which was intolerant to say the least, and in a community which relied on conformity for survival; jazz became the sign of a new time. Although we do not hear the music itself within the play; it is the ghost of the future which calls the young pianist away from the fearful inward looking church. However, Baldwin also demonstrates how the church is at the heart of the community; with its surprisingly female - dominated power structure, and the almost magical powers of life and death expected from the Pastor, Sister Mary. The members of the congregation are played with a gentle irony and empathy by the actors, and the power struggles amongst the congregation are shown resulting from poverty, and the unfulfilled lives of people living in a ghetto. Despite the social content, the play actually seems to have the same uplifting effect on the audience as the music. The acting, set and arrangement draw you into a world where people are struggling against the odds, but still managing to produce light from the darkness that surrounds them. It is a credit to Baldwin, and the director Anton Phillips who was responsible for the first staging (originally at The Tricycle as well); that the play still has a resonance for the black community; and as a piece of drama can draw in even those with no knowledge of the background or issues. The actors and singers, as well as the arrangement of both into a seamless flow carries the audience swiftly through the two and three quarter hours. This is recommended to anyone who wants intelligent entertainment, with music that could almost make me a convert .